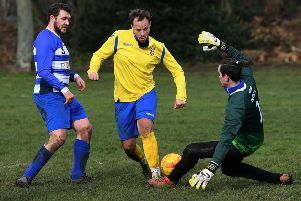 Golcar United continued their push for the title with an 8-1 demolition of Route One Rovers. Alex Hallam was the star man for the hosts as he struck a hat-trick, whilst Doran Jordan hit a brace, and Josh Land, Craig Cartwright and Ryan John found the back of the net. Habeeb Ahmed’s goal for Route One Rovers proved to be nothing more than a consolation, with Golcar racing into a 4-0 half-time lead. Rovers now lie seventh in the division with just one win from their last five games, whilst Golcar United are seven points clear of second-place TVR United. TVR United kept the pressure on Golcar with a 2-1 victory against PFC. Goals from Faisal Shabir and Abid Khan helped United to all three points, with Mohammed Zubar Khan’s not enough for PFC. TVR United have lost only one of their last nine league games, which was to Golcar United, who they trail by seven points with two games in hand. PFC remain in 10th with just 10 points from their 17 games. Steeton Reserves won a high-scoring thriller as they outlasted Toller FC in a 5-4 victory. Kamran Khan’s four goals were not enough for the hosts who led 3-2 at the break. Steeton’s Casey Dowthwaite hit a hat-trick, with Ben Cox and Josh Debenham also scoring to secure the three points. Steeton moved into the top half of the table with the three points, whilst Toller stay ninth. Goals from Chris Silkstone, Brad Tynan, Luke Hartley and Ashton Richardson helped Ryburn United to a comfortable 4-0 victory over basement side Lepton Highlanders. Ryburn United further strengthened their top-five position, whilst Lepton remain six points adrift at the bottom of the division. Bradford Olympic and Lower Hopton, and Littletown and Ovenden West Riding saw their games postponed owing to the weather. CARLTON Athletic booked their place in the West Riding FA County Challenge Cup quarter-finals with Saturday’s 4-2 success at Britannia Sports, writes LEE SOBOT. Top of the West Yorkshire League Carlton’s Anees Younis bagged a brace with Liam Moore and Tom Griffiths adding a goal each. Fellow West Yorkshire Premier side Huddersfield Amateur also sealed their ticket to the last four with a win, 4-2 on penalties at home to West Yorkshire League Division One side Hartshead after a 1-1 draw. The last remaining quarter-final – between hosts Field and Grassington United – will take place this coming weekend. In the County Challenge Trophy, Yorkshire Amateur League Championship promotion pushers Wortley progressed into the quarter-finals with a 4-1 success at home to Halifax League Premier Division side Shelf United. Wortley trailed 1-0 at the break but the introduction of Matty Dalton transformed the hosts whose Ryan Sharrocks blasted in four goals in the second half, the second after a sublime pass from Joe Cryer pass. Fellow YAL Championship side Leeds City Old Boys bashed Wakefield League Division One visitors Fieldhead Hospital 8-4. City’s Marc Saunders bagged a hat-trick with Ali Lewis and Adam Fox adding braces and Dave Barwick also netting. 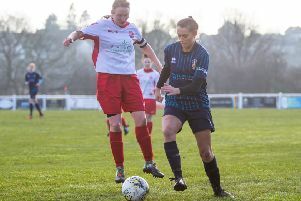 Also from the YAL Championship, Mount St Mary’s fell to a 3-0 reverse at home to Beeston St Anthony’s Reserves from the West Yorkshire League Alliance Division One. After a goalless 75 minutes, the arrival of Luke Boyes proved the difference as he fired Saints ahead before Aaron Connor and Matty Wood also struck. YAL Division One side Idle fell to a 2-1 loss at Huddersfield YMCA who led 2-0 before Jack Strudwick gave Idle late hope. WYL Alliance Division One side Whitkirk Wanderers Reserves saw off visiting Huddersfield Amateur Reserves 4-0 but Robin Hood Athletic Reserves were ousted 6-5 on penalties at home to Linthwaite Athletic after a 3-3 draw. Normal time strikes from Timmy Barton, Corey Eaton and Stephen Hancock proved in vain for Robin Hood. Malt Shovel also progressed with a 1-0 win at home to FC Sporting Keighley.